Data provisioning is the way to get DATA from SAP sources such as SAP ERP, SAP BW or non-SAP source such as Microsoft Excel to the HANA Database. It is a process of creating, preparing, and enabling a network in order to provide data to its user through HANA Database. 1) Extract – it is the first phase pf ETL where the data is extracted from the different source system. 2) Transform – In this second phase of ETL, a series of functions are defined for the data extracted from the source system in order to transfer the data into the target system. 3) Load – In this last phase pe ETL the data gets loaded in the target system. From a file, without ETL tools (SLT, BODS, and DXC) SAP HANA support uploading data. HANA Studio Revision 28 (SPS04) new feature is this. The user needs to create control file (.CTL file) prior to this option. To exist in SAP HANA and to upload data in SAP HANA Database, the table is needed. records will be appended at the end of the table if the table exists but if the table is absent then table need to be created. SAP Data Service tool allow us to load data from any source to any target either in real-time or in a batch process. It is a one the certified ETL tool from SAP to perform Batch loading into SAP HANA. LT Replication Server leverages proven System Landscape Optimization Technologies (SLO). System Landscape Optimization Technologies is used to consolidate and unite the system landscape. It a key offering foster SAP's Application Management Lifecycle. 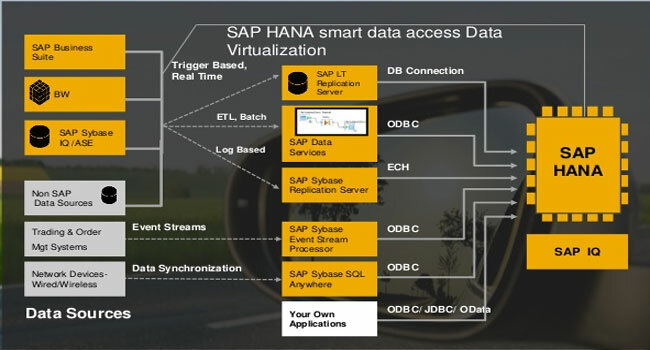 SAP HANA Direct Extractor Connection(DXC) is an additional data acquisition technique which has been added to the existing SAP HANA data acquisition techniques. DXC provides out-of-box foundational data models to SAP HANA which are based on SAP Business Suite Entities. SAP Business Content DataSouce are available to deliver data directly to SAP HANA.